Volume Lash Extensions are a thinner diameter, lightweight faux mink that create fullness you can’t achieve with Classic Lashes. 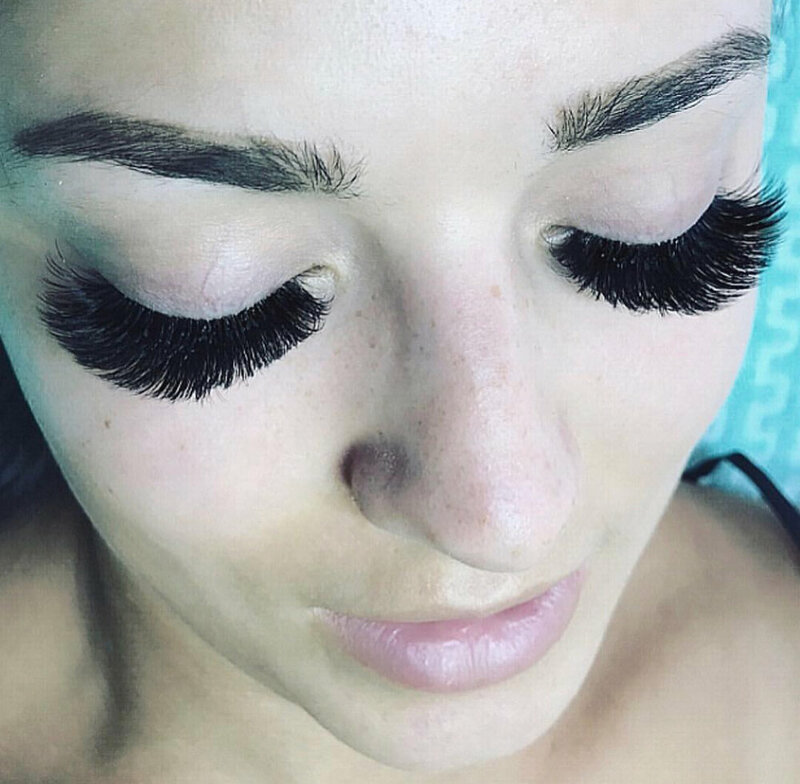 We create beautiful fans of 2-6 dimensional lashes to give you a luscious set of full, fluffy and gorgeous extensions specially designed for each individual. Approx. 150-600 lashes per eye. Please note: Mascara CAN’T be applied to these. MEGA VOLUME extensions are soft and super light. The thinnest imaginable lashes! Beautiful 0.03 lashes the lightest weight possible- perfect for Mega Volume Russian look. These lashes are designed to be very light weight and able to make fans of 10-16D! This does not damage the natural lash at all. A set made of these lashes is the most catching and soft, giving intense density and blackness to lashes! Please note: No mascara or eyeliner can be applied to these. Eyelash Extensions are a synthetic polyester filament skillfully attached to one healthy, natural lash to add length and volume. They are weightless, semi-permanent, easy care, pre-curled and 100% waterproof. Swim, spa and sauna safe.They can be worn natural or dramatic, are long lasting and they eliminate the need for mascara. When applied properly they can last up to 2 months. As your natural lash grows and sheds the lash extension sheds with it. Your natural lash cycle can be 4-10weeks so we recommend getting your lashes filled every three to keep them full at all times. Your new Lash Extensions are very low maintenance and easy to care for. They are fully cured by the end of your procedure so you can get them wet immediately if you so choose. Always treat your lashes with gentle care. Wash your lash extensions daily with baby shampoo and baking soda or oil-free make-up remover. Use upwards strokes letting the soapy foam clean between the lashes. Rinse thoroughly. Dry before sleep or applying any cosmetics. Do not use cotton rounds or q-tips on your eyelashes. Gently groom you dry lash extensions with a clean mascara wand or an eyeshadow brush. Use flocked applicators or sponge tipped applicators to spot clean any stubborn make-up left at the lash line. Apply eye creams, serums or moisturizers SPARINGLY when near the lashes. Blot off all excess that has not absorbed within 2 minutes. Only water based mascara can be used on Classic Lashes and should be used sparingly on the tips only.DO NOT USE OIL BASED MASCARA OR WATER-PROOF MASCARA. It will ruin your extensions. Schedule regular touch-ups to keep them looking wonderful.